Like most Americans, I get too much junk mail. Pretty much everything that arrives in my mailbox is annoying and worthless and just asking me for money. 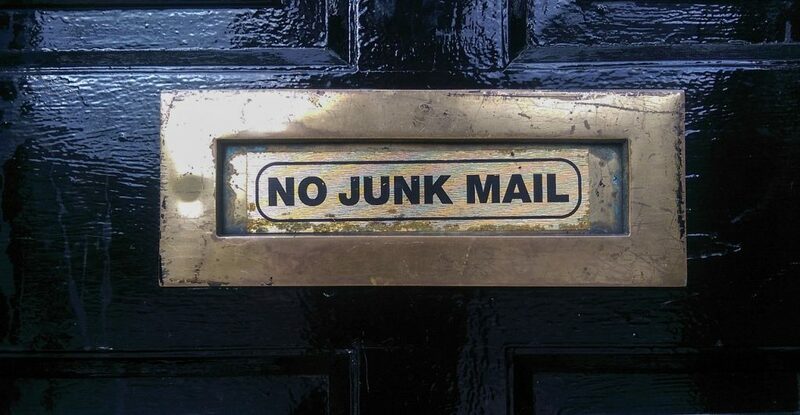 But it especially grinds my gears when companies send junk mail to their own customers. That’s what happened to me, once again, today when I got yet another letter from my credit union asking me to borrow more money on a home equity line of credit – they sent me junk mail with a bunch of blank checks that I could use immediately to write checks to pay for new purchases by borrowing more money on my HELOC. I don’t want to borrow more money from my HELOC – I have more than enough mortgage debt already, thank you very much. Even if I did want to borrow more money, I wouldn’t want to do it spontaneously by filling out a blank check that randomly arrived in the mail; borrowing against the equity in your home is not a low-risk proposition and it should not be taken lightly or done frivolously. Why are they sending me blank checks in the mail? I didn’t ask for this. What if that check falls into the wrong hands? What if someone steals your mail and borrows a bunch of money in your name? This whole situation is stupid and uncalled for and I wanted to stop getting this junk mail. So I called the credit union to ask them to take me off the solicitation mailing list. I even called the 800 number at the bottom of the letter that they provided to me to “call if you have any questions,” etc. I was instantly exasperated. I was calling about a specific problem that they had caused, and the company apparently wasn’t aware that they were responsible or had even sent me a letter in the first place. It drives me nuts that in the age of the Internet, we still have all these companies who are sending junk mail that doesn’t even get opened by 98% of people (or more) who receive it. Yeah, I’m sure the Direct Marketing Association will tell you that direct mail still works, and that’s probably true to some extent, but why are you spamming your own customers? I already had a business relationship with this company, and I never asked to be on their mailing list, but they just ASSUMED that I wanted to hear from them with their annoying and invasive mail offer. Shouldn’t there be a better way to interact and engage with your own customers, especially? Instead of blasting out an expensive, wasteful direct mailing that’s not even going to be opened by most people – or that will actively annoy some of the precious customers who ALREADY CHOSE TO GIVE YOU THEIR MONEY – why not find better ways of getting the right people connected with the right offers? Junk mail is a bullhorn; content marketing is a magnet. I shouldn’t have to take time out of my day to call my credit union to demand that they stop filling my mailbox with crap. Just because you have someone’s contact information doesn’t mean you have their permission to contact them. Permission is PRICELESS. My credit union has an existing customer relationship with me, which they have now damaged by sending me junk mail and then handling the situation poorly. Instead of forcing me to “opt out” of their marketing, instead of assuming that I wanted to hear from them with marketing offers, my credit union should use “opt in” marketing to qualify prospective customers AHEAD OF TIME and GET PERMISSION in advance BEFORE they start sending offers to us. Stop wasting paper and squandering everyone’s time. What if, instead of bombarding people with junk mail that they never asked for, companies spent more time and resources upfront on identifying the RIGHT customers who were truly open to receiving those offers? What if you spent more time cultivating an “opt in” culture of marketing where your customers were so engaged with your company that they actively CHOSE to receive your newsletters and mailings, because your content delivered so much value and was so fun to read and helped them learn new things? But doing “opt in” marketing is hard and time-consuming and requires creativity and courage, so instead, companies just crank out another mailing list and smother us all in spam. It doesn’t have to be that way! Spend more time earning your customers’ permission and building an audience of customers who are happy – no, thrilled! – to hear from you, instead of annoying them with junk mail. What if, upon receiving those blank checks in the mail, I was actually EXCITED about it? What if I had been really happy to receive that offer, and was thrilled to suddenly have an easy excuse to go to Lowe’s or Home Depot and buy a new kitchen counter with my HELOC money? What if I actually HAD been the target audience for this junk mail offer, and I just had some follow-up questions that I wanted to ask before writing the checks, so I decided to call the number at the bottom of the letter? Well, I would have been disappointed! Because the first customer service person I talked to didn’t know anything about the letter! Even if I HADN’T been annoyed by the junk mail, even if the junk mail was a golden opportunity that I was thrilled to receive, then it’s STILL a missed opportunity because the company’s not set up to handle “success!” If you’re going to take the time and spend the resources to send a marketing message to your customers, MAKE SURE YOU’RE READY FOR IT TO SUCCEED. Don’t direct your new sales leads to a generic phone line of automated prompts and clueless customer service reps – give them a special dedicated phone number that takes them directly to a real person who is trained specifically to answer their questions! Even if I had WANTED to do business with this company as a result of receiving their letter, this company wasn’t ready to do business with me! What’s the point?? Why bother sending me something if you’re not ready to talk about it?? ?